Ramsey compiled records as an athlete and a coach which may never be equalled. Ramsey, the first woman to make the Hall, was the mainstay of the Lettes pitching staff for many years, finishing with a 401-90 record. 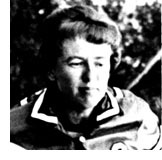 She was named an All-American in major fast pitch softball four times and took part in many national tournaments in an era when the Lettes were ranked with the top teams in the country. After retiring as an active player, she became softball and basketball coach at Illinois Central. Her basketball teams appeared in nine consecutive national junior college tournaments and had a 12-season record of 276-83 while her ICC softball team won a national championship last spring in Rockford. On the international scene, Ramsey was assistant coach of the United States Women's softball team that won the gold medal in the Pan American Games in Puerto Rico in 1979, and in 1981 she was assistant coach of the United States basketball team that won the Silver Medal at the World University games in Romania.